♠ Engraved artworks on distressed birch wood, painted with the colors of your choice. ♠ Unique wall decor idea for living room, office, kitchen, man cave or any other place. Add a mystic and classy touch to any room. ♠ Ready to hang. Each skull has on its back Double-sided, removable tape ideal for mounting lightweight objects on walls. Securely mounts the skulls on walls or doors with easy, clean removal when needed. 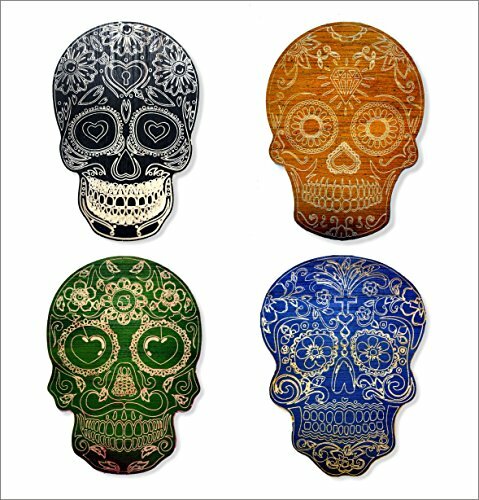 ♠ Careful, Detailed engraving ♠ SIZE: Each wooden skull is 12" x 9" (30cm x 23cm), set of 4 Skulls.♠ Do you need a custom size? Please contact us ♠ Thank you for visiting!